"Love to Possess and to Impart"
Epiphany's theme of the manifestation of Christ continues with the Cana story. John's multi-layered text offers a rich choice of images; heavenly banquet, wedding feasts, Eucharist, exuberance and joy, abundance, the nudge of mother to son, the “hour” of Jesus. I've always loved the observation by the steward that this “best wine has been reserved for last.” In a life of faith, flavor, body, depth and refinement, strengthens more fully in the gradually deepening experience of Christ. But the story also imparts a recurring irritant - the obvious contrast between the miracle in Cana and the present need of people for water, food, shelter. Making this connection is essential to the essence of any individual whether that person is of a faith or not. The prompts: a poetic rhapsody on sacred wine sets up the dynamic of both possessing and sharing (Meditation One). The great Hafiz urges expansiveness of heart - why be like a small unopened bottle of wine? Rather, be selfless, transparent, generous (Meditation Two). In the pattern of Edge of Enclosure thought-prompts, the third meditation turns the heart back toward the needs of the world. Here you'll find an acknowledgment of ever-present thirst, the need to depend upon God yet act in the world from the abundance of love (Meditation Three). Let us create Cana feasts as we are able. The purpose of wine is not only to quench thirst, but also to give pleasure and satisfaction and exhilaration. "My cup, how goodly it is, how plenteous!" ...Wine possess a sparkle, a perfume, a vigour, that expands and clears the imagination. Under the form of wine Christ gives us his divine blood. It is no plain and sober drought. It was bought at a great price, at a divinely excessive price. Sanguis Christi, inebria me, prays Saint Ignatius, that Knight of the Burning Heart. In one of the antiphons for the feast of Saint Agnes, the blood of Christ is called a mystery of ineffable beauty. "I have drawn milk and honey from his lips, and his blood hath given fair color to my cheeks." 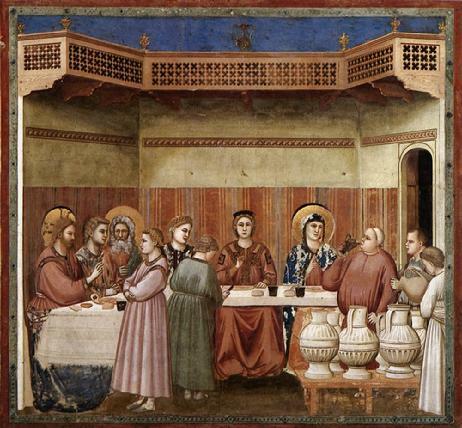 For our sakes Christ became bread and wine, food and drink. We make bold to eat him and to drink him. This bread gives us solid and substantial strength. This wine bestows courage, joy out of all earthly measure, sweetness, beauty, limitless enlargement and perception. It brings life in intoxicating excess, both to possess and to impart. Our Redeemer became our Bridegroom. The bride became exhilarated at the sight of his noble countenance. Under this immense force she loses herself. The less she becomes, the more flows into her. The more loving God is to her, the higher she soars. The more his desire grows, the more extravagant their wedding celebration becomes. The narrower the bed of love becomes, the more intense are the embraces. The sweeter the kisses on the mouth become, the more lovingly they gaze at one another. The greater the distress in which they part, the more he bestows upon her. The more God's praise is spread abroad, the greater her desire becomes. like an unopened bottle of wine? the more colorless your ragged wet coat will get. Be like Hafiz: Get up and make an effort. Don't lie around like a bum. He who throws himself at the Beloved's feet is like a workhorse and will be rewarded with boundless pastures and eternal rest. "When the wine gave out..." These words bear a weight of feeling. One imagines the pain attending such an embarrassment at the great event in the lives of these two poor people. The words resonate on other levels, too. They express something of the profound and manifold sorrow of the human condition. The wine is always giving out. And as the day wears on, we are more and more aware that we cannot replenish it from our own resources. True love is delicate and kind, full of gentle perception and understanding, full of beauty and grace, full of joy unutterable. There should be some flavor of this in all our love for others. We are all one. We are one flesh in the Mystical Body as man and woman are said to be one flesh in marriage. With such a love one would see all things new; we would begin to see people as they really are, as God sees them." I would have loved to see Jesus dance at the wedding at Cana. What kind of dancer was he? When he danced in a circle with other men, like Israelis or Greeks do now - did he stand out? Could he leap higher, turn in mid-air, plunge lower, spin to the left and to the right more radiantly than the other guys? Or, was he a bit off, not jiving with the music, never hitting the groove. Oh, that Jesus, he's a good storyteller all right, but dancing? Ehhh... not so much. Even though in the beginning, before the world began, dancing to the music of the spheres, he could leap like a man on the moon. Once the Word was made flesh, his rhythm choked. Jesus was 'tempted in every way as we are but did not sin', nevertheless he didn't inherit the dancing gene from his ancestor David, who was brilliant, both as a sinner and dancer. “Your boy needs to loosen up,” an observant matron with nothing better to do says to Mary. “Give him some more wine.” Mary checks on the wine. A little awkward with social skills herself, she brings the problem not to her host but to her son. But he's just finally found his groove, his eyes rolled back up into his head. She taps him on the shoulder. “What's the wine situation got to do with you or me? Get thee behind me, Woman, I'm dancing.” But the interruption breaks his mojo and he's all left feet again among the circle of men practicing their manly arts. Being a little tipsy, his rhythm off, he does what it's not yet time to do. This is no party trick. Once again, he'll have to get out of town fast. 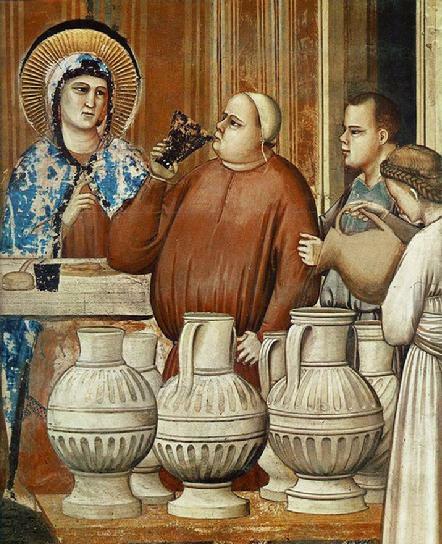 He attracted attention at Cana, but also some thirsty disciples. I will restore her to You.